The first half of this cynical war comedy is pretty audacious, if derivative. The plot – essentially, Kelly’s Heroes – has four Gulf War servicemen scheming to steal gold previously stolen by Saddam Hussein from the Kuwaitis. The beginning of the picture is loaded with funny bits reliant on the culture clash of Americans and Iraqis. Coupled with eye-catching camera work and clever forays into fantasy (the recreation of the route of a bullet into the human body is noteworthy), the film hurtles along, and you never really notice the complete lack of plot or character. 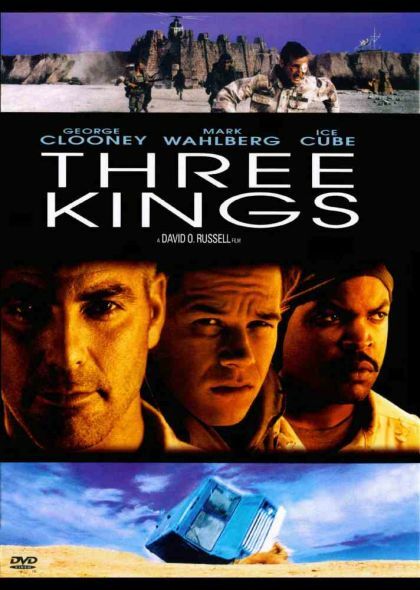 The problems ensue when Three Kings moves from the wacky to the message-laden. Faced with the horrors of war (dead civilians and specifically, the fate of Iraqis who rose against Saddam without U.S. support), our protagonist thieves become changed men. Up until this point, however, they are merely cleverly written cardboard cut-outs, so it is impossible to determine from where or what they have changed. The film also descends into hackneyed “I have met the enemy and he is me” tripe. The political moralizing becomes a bit much, and the sweeping feel-good ending is awkward. Messages delivered — the war was about oil, not the liberation of Kuwait; there is a human cost to civilian deaths; war is indeed hell; and, if we just listen, we can all get along. Still, the film’s first half is damn near flawless. The quartet – George Clooney, Mark Wahlberg, Ice Cube and Spike Jones – are also quite good, as are the people given the thankless, noble Iraqi roles.